Solution Finish is an incredible new product that restores originally black surfaces to a deep, rich black finish, without the "wet look". Solution Finish dries quickly with no greasy residue. 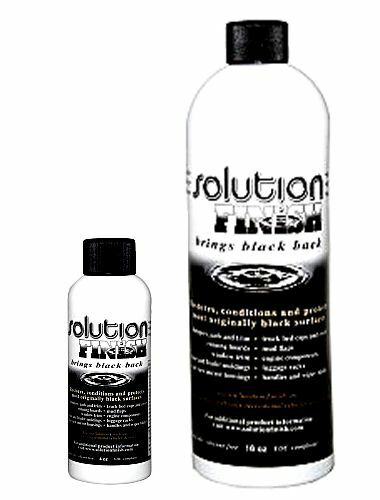 The unique formula combines common ingredients with advanced polymer technology to provide a spectacular long-lasting, black protective finish. Originally, for professional use only, it is a silicone-free solution that uses all natural oils and is VOC compliant. 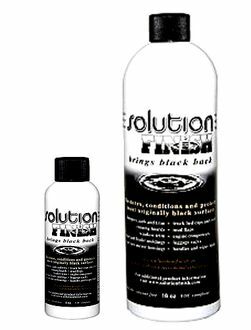 Solution Finish is ideal for restoring, conditioning and protecting any original black surface on your vehicle. Restores vinyl and rubber bumpers and trim, plastic on mirrors, mud flaps, window trim, seals, running boards, truck bed caps and covers, door handles and wiper blades. any oxidized black surface can be restored by Solution Finish. Solution Finish was developed by professionals for professionals – you won't find it on the car care product shelf in your local retail outlets. Professional detailers need products that are fast, easy to use and produce outstanding results, which Solution Finish provides. 1oz. bottle restores up to three vehicles. 12oz. bottle restores up to 36 vehicles.